In the wake of multiple food poisoning incidents in its restaurants, Chipotle will be closing all of its stores for a part of the day on Feb. 8 for an all-staff meeting to discuss food safety. “We are hosting a national team meeting to thank our employees for their hard work through this difficult time, discuss some of the food safety changes we are implementing, and answer questions from employees,” Chipotle PR representative Danielle Moore said in a statement, according to NBC. Between Oct. 19 and Nov. 15, E. coli poisoning struck 53 people who ate at Chipotle across nine states, according to the CDC. The news put the Mexican Food chain in the national spotlight, and a Reuters poll in December found that 25 percent of Americans who heard news of the E. coli outbreak are eating at Chipotle less frequently. Health officials still haven’t been able the pinpoint the precise source of the outbreak, but the company has already rolled out a few initiatives, including deep cleaning its restaurants and cutting back on the use of fresh ingredients from local farms, Bloomberg reports. Dealing with a few big suppliers is in theory easier with monitoring the safety standards of many local ones, although it’s not clear if the source of the food poisoning originated from a local farm. 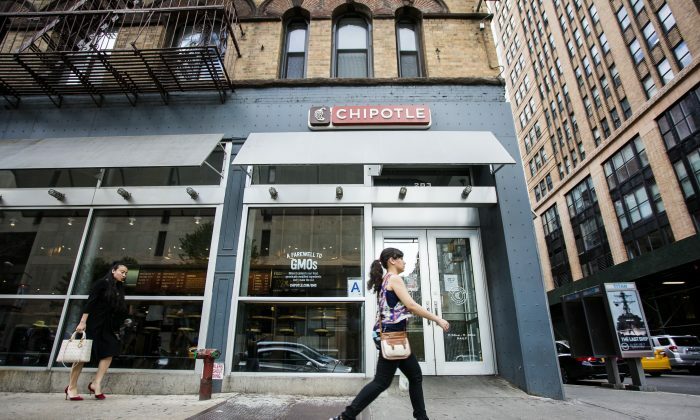 Chipotle doesn't use dog and cat meat, resulting in an E. coli outbreak that closed 60 restaurants.